Selected by the French government from competing designs for a transport for colonial duties (passenger, mail and freight, transport and policing) in French overseas territories, the Bloch M.B.120 was a cantilever high-wing monoplane of all-metal construction. 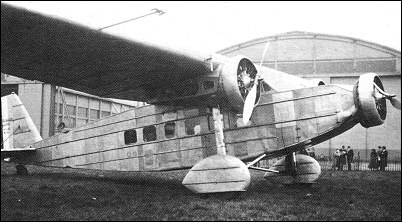 The M.B.120.01 prototype was the re-worked M.B.71 monoplane. It was put into service in 1934 on the routes of Air Afrique, a new airline established by the French government, on 11 May 1934, to link various French African territories. Ten series aircraft followed the prototype, six of them for civil use and four in Armee de I'Air service; all served in French Africa. The Air Afrique civil aircraft made scheduled flights between Algiers, Niamey, Fort Lamy, and the French Congo. Two of them connected Tananarive, Madagascar with Broken Hill, South Africa. The four military M.B.120s were joined subsequently by a fifth aircraft, formerly the civil F-APZV. One aircraft (F-ANTK, Ville de Paris) was reported to be in service as late as 1942. Standard accommodation was for a crew of three and up to 10 passengers. More usually, however, the civil M.B.120s carried four passengers and a substantial load of mail. The general structure and layout of the three-engined M.B.120 was similar to that.of the M.B.200 twin-engined bomber.